What’s better than Cookies for Breakfast? A NEW WIZARD for Breakfast! Yes indeedy, Brown came through for me this morning! And what to my surprise did I see when I opened that box? My artwork gracing the top of the box! That’s my card, the leaf card in the middle. I heard a rumor it would be there, but I wanted to see it with my own little eyes. Pardon me while I happy dance! Ok, on to the rest of it, I lifted the colorful box carefully from the shipping box and ripped it open. Inside I found a pristine raspberry colored Wizard, yes, the very same machine you are entering to win. Being on the Design Team sure does have it’s perks! I photographed the contents, so you know what your $99 US retail buys. You get a User Manual, an instructional DVD, a die (this is a new addition to the box, it never used to come with any dies! 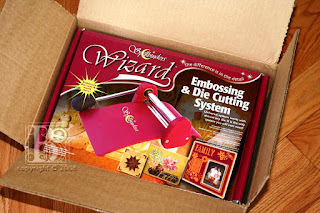 ), a Wizard, of course, and all the mats you need to cut and emboss every die on the consumer market. 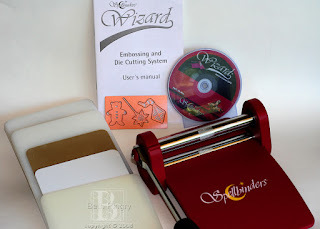 Be sure to check out the videos I uploaded from YouTube, you’ll be a cutting and embossing pro in no time. I also want to tell you what each mat is for. See those 2 mats on the left? They are the largest mats in the package. Those are the top and bottom mats, or the Cut and Emboss mats. 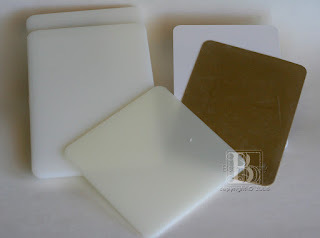 The white mat on the right is the Spacer Plate, it is used as a shim when you cut dies from Spellbinders and Quickuts, and any other thin chemically etched dies. When using Cuttlebug, Sizzlets and similar dies, with a plastic back to them, you don’t need this Spacer Plate. The square mat in the front, on the angle, is the Universal Cutting Mat. That is for the Original Sizzix, and other thick dies. I can’t forget the Tan Embossing Mat. Its the tan rubbery mat on the right. That is used to emboss Spellbinders dies, emboss brass stencils, emboss with just about anything. I’ll have more details on embossing in the future. I can’t wait to run my new Wizard thru her paces, but first she needs a name. And I need to eat ribs at our local festival! And I’m going to have a frosty cold one, because today marks the end of my first 2 weeks on the South Beach diet. Hey, I lost 6 pounds! Just a couple more and I’ll be happy, but first I want a Triscuit like nothing else. And a cookie. Be sure to enter Wendy’s drawing for her Sneak Peek die, and get over to Heidi’s, the bar keeps getting set higher on those projects! I’m shaking in my shoes here, I hope you will love my Sneak Peek on the 9th as much as I love the projects you’ve already seen. Holy crap! You have such a cool blog….I’m bookmarking you now! WOOHOO! Such a pretty new Wizard, and your card just ROCKS!! Wtg, girl! You have a great gig! Free goodies and your art on the box! How cool is that??P.S. I LOVE your blog. How FABOO that your art is on the box!!!! Congratulations!!! !